FRANKFURT -- Toyota Motor Corp. lost its title as the world's best-selling automaker to Volkswagen Group, ending the Japanese company's four-year reign, as demand for its flagship Camry sedan waned in the U.S. and sales in China expanded at a slower pace than the overall market. Toyota's global sales, including its Lexus, Daihatsu and Hino brands, rose 0.2 per cent to 10.2 million vehicles in 2016, the Japanese automaker said on Monday. That fell short of VW Group's record 10.3 million cars, trucks and buses, a 3.8 per cent gain. By another key yardstick, however, Toyota continues to outperform its European rival. Toyota's profit was more than double Volkswagen's in the six months through September, according to data compiled by Bloomberg. Both the companies haven't reported earnings for the quarter ended Dec. 31. Toyota's sales last year lagged behind Volkswagen mainly due to the changing dynamics in the both automakers' largest overseas markets: the U.S. and China. While the Japanese company was hampered by a broad U.S. auto industry sales slowdown, VW benefited from its growth in China and a tax cut there that has stoked consumer demand since 2015. Looking ahead, Toyota must contend with possible trade tensions as U.S. President Donald Trump pressures foreign automakers to make more cars and trucks in the U.S. VW, meanwhile, faces decelerating demand in China as the tax reduction expires. Since his inauguration, Trump has withdrawn the United States from the Trans-Pacific Partnership trade accord, reaffirmed a campaign promise to renegotiate the North American Free Trade Agreement involving Mexico and met with automakers to persuade them to keep production within the U.S.
Toyota will invest CDN $13 billion (US $10 billion) in the United States over the next five years, maintaining its pace of spending during the last half decade, joining other manufacturers with highlighting projects in response to pressure from Trump to create jobs in America. After criticizing Toyota's plans to build a Corolla plant in Mexico, Trump rebuked Japan last week for sending the U.S. hundreds of thousands of cars from what he said were "the biggest ships I've ever seen." "Trump is a bigger risk for Toyota than for Volkswagen because the German carmaker has a small exposure to the U.S. market," said Ken Miyao, an analyst at Tokyo-based market researcher Carnorama. "Toyota has made investment to build a new plant in Mexico and will have limited options to appeal to Trump." Toyota built its first U.S. assembly plant in Georgetown, Kentucky, three decades ago, in part to appease Washington during an era of icy trade ties. Since then, it has added factories in the country. Last year Toyota built more than 1.38 million cars and trucks in the U.S., behind only General Motors Co., Ford Motor Co. and Fiat Chrysler Automobiles. Still, Toyota's production was about 1 million vehicles short of its sales in the country. Any push for investment growth will come up against a U.S. auto market that is likely to wane after a reaching a peak in 2016. 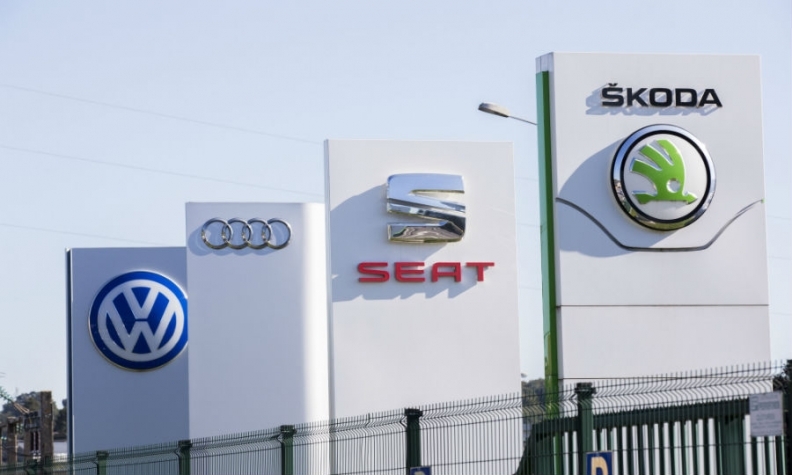 "The development of the U.S. market is set to decide if VW can stay ahead of Toyota this year," Sascha Gommel, a Frankfurt-based analyst at Commerzbank, said. "If the Chinese and European markets continue to be solid and the U.S. market weakens as I expect, VW might stay first in 2017 as Toyota has a larger exposure to North America." The Japanese automaker's deliveries in the United States declined last year, trailing industrywide growth, as demand for its Camry slowed ahead of the introduction of the next generation of America's best-selling sedan. The latest iteration of the model was unveiled at the Detroit auto show earlier this month. Deliveries of Toyota in China climbed 8.2 per cent in 2016, compared with the industrywide sales growth of 15 per cent. In 2008, Toyota ended GM's 77-year reign as the world's largest automaker, holding on to the top annual sales spot until 2011, when it surrendered the title after production was disrupted by natural disasters in Japan and Thailand. The Japanese company regained the lead in 2012 and kept the position through 2015. For Volkswagen, taking the global sales crown marks the culmination of an aggressive expansion that former CEO Martin Winterkorn began 10 years ago. While surging demand in China and expansion of the upscale Audi and Porsche brands' line-ups have propelled sales gains, the group's growth hit a wall in September 2015, when the carmaker and U.S. regulators revealed that some of its diesel engines carried software to cheat on emissions tests. Volkswagen's namesake brand accounted for almost six million of the group's global deliveries in 2016. The marque is targeting sales of three million cars this year in China, the company's biggest national market. In Germany, its second-largest market, the division is reducing its large leasing fleet for employees, which started to hurt new-car registrations toward the end of last year.